[內容簡介] (本項為出版商制式文字, 不論下文註明有無附件, 仍以本拍賣商品標題為準, 標題未註明有附件者一律均無) Ernest Hemingway's life was as romantic and exciting as anything in his novels and stories -- and this magnificently illustrated large-format volume captures many of his best years. 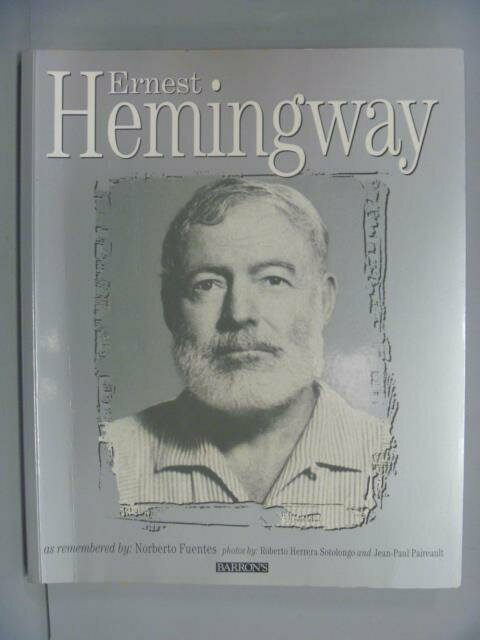 The text, recounting Hemingway's life and times between 1939 and 1960, is a remembrance by Norberto Fuentes, who was Hemingway's good friend during that period. In the book's vivid photographs, we see Hemingway on African safaris, in Venice with his wife Mary Welsh, fishing for marlin in the Gulf Stream, socializing at his favorite cafes, and relaxing at his homes in Cuba, Key West, and Idaho. Still other dramatic candid shots show Hemingway on movie sets, for instance with Spencer Tracy during the filming of The Old Man and the Sea, and with Gary Cooper and Ingrid Bergman during filming of For Whom the Bell Tolls. The more than 150 candid black-and-white photos of Hemingway and friends at work and at play, were taken by his friend and associate, Roberto Herrera Sotolongo, and had never appeared anywhere until the publication of this book. Another 50 full-color photos taken more recently capture the different atmospheres of the writer's several homes.